Identify and discern SEO issues in your website with our comprehensive report! We believe in constantly learning and strive to master all trends in the dynamically changing world of internet marketing. Our unfailing dedication to our work and providing the best service possible is what sets us apart. Pyrite Technologies offers a wide range of services that get you on the map and help you stay there, building an online presence that endures. Whether you want to create a new presence or build upon your existing image, we have you covered either way! We help you formulate practical visibility goals and reach them by inbound marketing and content development strategies. Prioritized visibility for maximum outreach around the world, the key to progress in today's world. Search Engine Optimization is the process that lets you create and maintain a lasting online presence in today’s fast moving world. No matter your establishment’s focus, visibility is the key to move forward, and that’s exactly what we provide. Invoking quality customer engagement on popular social networks. Social Media Optimization is the most popular new way to facilitate communication with your customers through popular social media networks like Facebook, Twitter, LinkedIn and more. Staying in touch with them gives you invaluable on ground input. Creating engaging, relevant and personalized content for your target customers. Providing your customers with a value proposition in the form of knowledge and content is one of the most important ways of sustainable growth. Without customer retention, getting new customers may not result in optimal progress. Marketing your E-commerce store for higher conversion rates, ROI and loyal customer base. ElProCus came to us with a problem they had been facing since a long time, low traffic. Frustrated with the low number of visitors per month, they were very far from the target of loyal customers they wanted to achieve. That’s where we came in. Creating a customized strategy was just the first step in a long term plan that would help them become an authority in various niche areas, as well as facilitate a traffic increase overall. 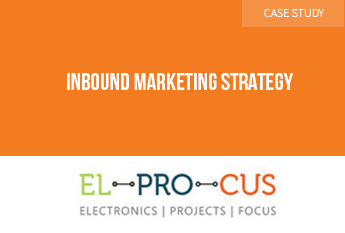 Our case study presents all our findings and the approach we took to their specific problem. Pyrite Technologies has helped us to get the lost traffic, rankings and branding by 157% more than previous years. This was something we always dreamed about in the past.